Dr. Fors is a 1982 graduate of Northwestern College of Chiropractic, a Board-certified Neurologist (IBCN); nationally certified in acupuncture and certified in Applied Herbal Sciences (NWHSU). He is a recognized expert in the field of chronic pain and brain health lecturing internationally to doctors on a variety of subjects including chronic pain disorders, autism, ADHD, depression, and neurodegenerative disorders such as Alzheimer's. His clinical experience includes many years of teaching and successfully treating a wide variety of complaints by utilizing alternative therapies. He is the inventor of the FENIX Rehab System; an active therapy devise for myofascial trigger points, and founder of FENIX Recovery Enterprises (www. fenixstopspain.com) created to help individuals with chronic myofascial pain disorders. His highly acclaimed book "Why We Hurt" was released December 2007 and can be found at bookstores and libraries everywhere. As the Chief Science Consultant and educator for BIOSPEC Nutritionals, Dr. Fors creates cutting edge nutraceutical formulas to treat a wide variety of conditions. He also creates their educational materials for doctors and patients to improve clinical outcomes for many common conditions such as: chronic pain disorders, metabolic syndrome, cardiovascular health, autism, ADHD, and depression. Dr. Fors brings this expertise to the clinic to provide real healing for you and your family. Dr. Fors specializes in providing in-depth evaluation, diagnosis and treatment services for those of all ages who suffer from complex chronic conditions; natural biomedical care for your entire family! 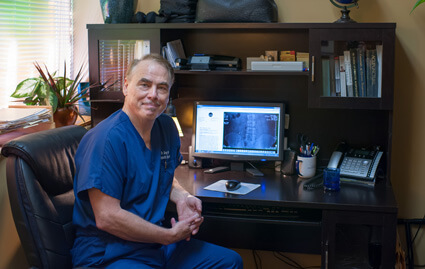 What makes Dr. Greg Fors different from every other doctor you have seen? It is the expertise he brings to your case! He teaches doctors throughout the country on how to utilize and interpret lab tests to assist doctors in healing their patients and so he bring this expertise to your healthcare. He also leaves no stone unturned to determine the exact cause of your condition so I can provide real healing for you. Do you ache all over at times? Do your muscles hurt when you exert them? Does fatigue haunt you? Are you noticing other health issues: digestive problems, mood swings and brain fog? You may be suffering from fibromyalgia, myofascial pain syndrome and/or Chronic Fatigue syndrome. I am Dr. Greg Fors a Board-certified Chiropractic Neurologist (DIBCN), nationally certified in acupuncture and certified in Applied Herbal Sciences (NWHSU) and author of the best-selling book on fibromyalgia and chronic myofascial pain “Why We Hurt”. As a recognized expert in the field of chronic pain and brain health issues I would like a moment of your time to personally speak to all who are being tormented by fibromyalgia, myofascial pain syndrome and/or Chronic Fatigue syndrome. First and foremost I want you to know that you can recover; there is a path to real healing, I have done this with numerous patients and I can do it for you! Just know that you are not alone! More than 1 in 50 suffers from these syndromes. Fibromyalgia and Chronic Fatigue Syndrome are caused by a decrease in cellular energy production in your body and brain. This loss of energy production is caused by the poisoning of our cells by our deficient diets, chemical exposure and chronic infections! Ever wonder why there are so many energy drinks on the market now and coffee shops? This loss of cell vitality takes place throughout the body especially in energy demanding tissues such as muscles, the digestive tract and the brain. This loss of cell vitality leads to pain and disability, plus research is now shows rates of earlier death from preventable diseases. But you can get better! This can finally be achieved when the underlying metabolic issues are properly identified and treated; I have personally witnessed this with thousands of patients and individuals, even in myself and my own daughter! Please give me a call today at 763-862-7100 for a free consultation.